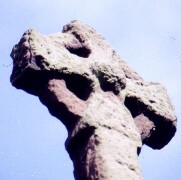 West view of Cross head, dated to the first half of the tenth century. The ring on the head is decorated with a three-strand bordered by a roll moulding. There is a boss at the centre enclosed within a frame formed by mouldings.